Which can be the foundation for a new, cooperative chapter in the nation’s capital. Record-breaking production of oil (11.7 million barrels per day in December) has added to global crude supply, putting downward pressure on prices. This, in turn, has contributed to lower prices at the pump – averaging $2.27, according to AAA – and savings for consumers. 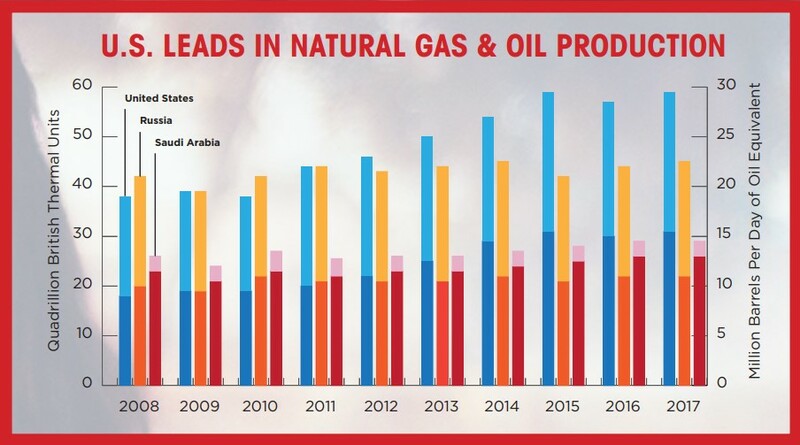 Increased use of clean natural gas as a fuel for generating electricity is the main reason U.S. energy-related carbon dioxide emissions have declined – even as global CO2 emissions have risen 50 percent since 1990. Two points on the path forward. The president talked about infrastructure and trade. Investment in 21st-century energy infrastructure is essential to safely deliver natural gas and oil to American consumers. Congress should work with the administration to ensure these investments can be made, to help fully harness significant natural gas and oil potential in the Permian Basin and other reserves. We’ve talked about difficulties that the administration’s tariff and quota policies pose for natural gas and oil development (see here, here and here), as well as impacts on important U.S. energy trade. Tariffs and quotas on imported steel should be ended so that critical infrastructure projects aren’t delayed or blocked. Indeed we can, with a big assist from energy.